There were a lot of people waiting for Marie at Disneyland today. I understand the first ones in line got there at 9:30 AM. The signing didnt start until 1:30 PM! The line wrapped around the restaurant located next door to the doll shop. Marie was a little late getting to the shop, but she did look gorgeous! She entered through an access area between Fantasyland and Frontierland. She had to walk past everyone waiting in line for her. 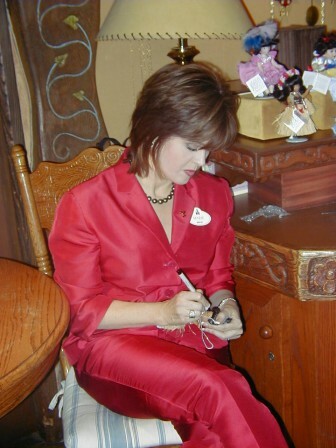 She wore a red pantsuit, similar to the ones she used to wear on The Donny & Marie Talk show. Maries husband, Brian, and Lisa, the Raven, were there, too. 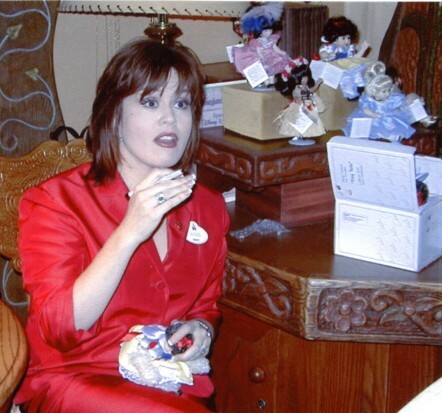 Marie was very gracious and talkative. She was seated on a chair, next to a table. She was able to stand up and pose for pictures with anyone who asked her to. 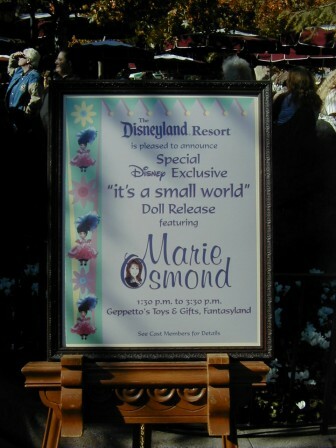 Marie mentioned that there will be more dolls in the Its a Small World series. One of the Cast Members said Wait until you see them! The first three Disney Baby Tiny Tots were also available for purchase. I met Marie at 3:30 pm and there was still a long line behind us waiting to get their dolls signed.